Look at yourself the way you look in the mirror to comb your hair, Kabir says. Wipe clean the mirror in your heart. When the self is free of lust, anger, greed, attachment, ego; that's freedom. In a radical departure from the norm of pursing wealth and success, in this song the poet Kabir celebrates the joy of poverty, and the beauty of simplicity. But this poverty is not wretched or empty – it is filled with the joy of Raam remembrance. Kabir claims that this joy is far greater than the joys afforded by material comfort or luxury. Saboori, or contentment, is the tool which takes one to fakiri, or the state of being utterly free – free of desires, wants and the incessant need for more! A special presence on stage in this song is Kaluram ji’s daughter Arpita, singing with gusto while she plays the manjiras. 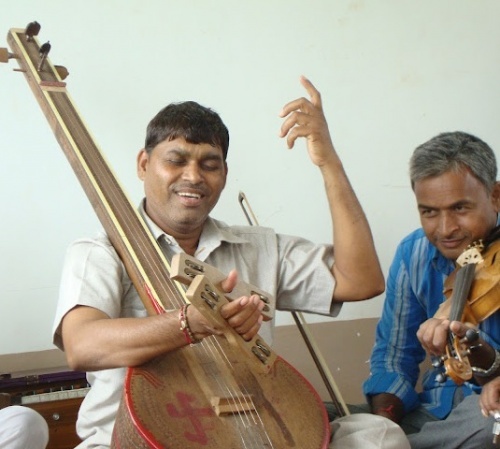 This perhaps best exemplifies how learning happens in the folk traditions – the sounds and styles are imbibed and absorbed through many hours and years of inhabiting shared spaces of satsang, both on and off the stage. Kaluram ji himself started learning at the early age of 9, by accompanying his father, grandfather and uncle on the manjiras. Kaluram comes from a family of farmers, and has little formal education. Apart from being a fine singer, he has a sharp and often mischievous wit and intelligence…”Kabir says, Liberation? She will be your slave! This almost arrogant confidence can only spring from the state Kabir is in”, says Kaluram. “Freedom is not something you’ll get from here or there. It can’t be given to you by someone. Going to temples, joining the Panth or singing his songs is not Kabir’s path to freedom!